Stephen Lee is a participant in the Amazon Services LLC Associates Program, an affiliate advertising program designed to provide a means for sites to earn advertising fees by advertising and linking to amazon.com. I keep meaning to sort out the piles of paper around me. When I need to clear my desk, I just move the pile on to a shelf, but of course I intend to sort it out soon. But a few months later, when I move another pile off my desk, the last one is still there. I've read some of Harford's books on economics, but will he be able to persuade me that an untidy desk (and shelves) isn't so bad after all? I can't help feeling that it's important for me to believe that I'll get round to sorting it out, even if I rarely do. Will this book just encourage laziness? The book starts with Keith Jarrett's 1975 Jazz concert in Cologne. The result was all-time best-selling piano album despite having to work around the problems of a substandard piano. Harford argues that it was the problems that led to a legendary concert. Shift an expert from their comfort zone and their ability to optimise might lead to something amazing. Well this doesn't seem to relate to my desk, but I can see other arguments against this idea. There's the story of a famous classical violinist giving a concert with a hugely expensive violin. He played the first piece, got rapturous applause - and then smashed the violin to pieces. Then the real violin was brought out. The message being, yes I can optimise with a cheap violin, but listen to what I can do with a really good instrument. Another argument is that it only seems to apply to experts - with anyone else it looks like it might well become an excuse for substandard work. It's entertaining to read these anecdotes though, so I'll see how much the rest of the book can convince me of the benefits of messiness. I have to say I didn't find that the book became much more persuasive. One problem is that it only seems to apply to those who are among the best in their field. You'd expect Harford to know about selection bias, but by concentrating to the behaviour of those of who have succeeded he misses the point that others may have had the same 'messy' behaviour, but in their case it caused things to go horribly wrong, but because they didn't succeed they don't enter into the discussion. One message from this book seems to be the tautologous: to do a lot of things you should do a lot of things. More precisely, those who have a variety of achievements have avoided getting bogged down with one item. Maybe it's a good idea to be able to move away from what you are working on, but if you're not among the best then that is likely to mean that you're just giving up too easily. Also, one of the examples of a 'one-trick' wonder was James Watson of DNA fame. The trouble is that Rosalind Franklin and Francis Crick were the thorough ones. Watson was the maverick who was willing to bend the rules to get what he wanted. He's hardly an example of the point Harford is trying to make. Harford tells of how a rowing team who weren't expected to win gained victory by shutting themselves away for several weeks and concentrating on the task in hand. That goes against the idea of the book, but the claim is that that this doesn't apply in other fields. Second tier mathematicians shouldn't follow their example. To me this is just muddled thinking, your achievements define whether you are top tier. Andrew Wiles proved Fermat's last theorem by working in secret for several years. Yes, Paul Erdős was a top tier mathematician who collaborated a lot and proved lots of theorems as a result - but most people wouldn't be able to name any of them. The arguments against the belief in magic algorithms are probably more justified (as I argue in my review of Luke Dormehl's The formula), but that is less related to messiness. Yes, machines may issue fines for traffic violations that didn't actually happen, but this is more about abuse of authority than about trusting tidy algorithms. The point is that when computers play a part, the evidence is there to be argued against. In the days when you just had to deal with bureaucrats without computers you wouldn't have been able to do this. One of the main problems with the book is that there is the tacit assumption that most things in life have to be some sort of competition. Dating websites, and many other forms of human interaction, are too formulaic. Instead we're supposed to emulate Brian Christian, who won a prize as the Most Human Human. Now young people are already getting stressed out by having to make sure that their social life (as shown by Facebook) is up to scratch. If they have to compete to have lots of novel stuff as well then it will increase the stress enormously. And to no purpose as far as I can tell. And then there's my desk. Harford's recommendation seems to be to occasionally throw out the bottom half of the pile. For me this would mean throwing away the important documents that I need to keep, and keeping the recently arrived junk mail. Somehow I don't think I'll follow that recommendation. We hear of how Benjamin Franklin aspired for tidiness throughout his life, but never felt that he got there. And yet he still achieved great things. But the point that Harford is missing here is that Franklin constantly aspired to tidiness. If he had just given up and accepted messiness things might have been very different. OK, so some of the book has a useful message. 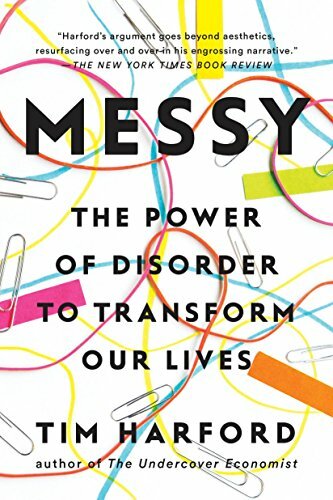 In particular chapter 8 makes the important point that complex systems are likely to be more resilient than tidy ones. It's easy to read, and reading a book where you're mentally arguing with the points made can be kind of fun. So you might want to give it a try, just don't expect it to change your life. Why not follow the Twitter feed?